Why do I keep going to these shows? 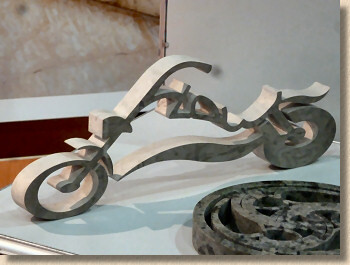 When was the last time I went to a show or exhibition and came away feeling that it had been a valuable use of my time? 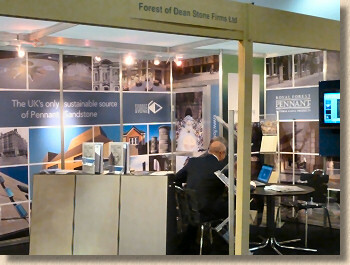 I'm not completely sure, but it's a good while, and the day spent at The Natural Stone Show in that London's ExCel centre today is not going to buck that trend. I desperately wanted it to be different. 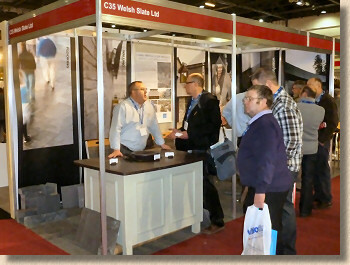 I know the exhibitor list doesn't promise much for us paving types, but after speaking with a number of trusted colleagues over the last couple of months, there seemed to be a sense that maybe, just maybe, the time has come for the trade to shake itself out of its slumber and get back to selling paving and hard landscaping once again. Contractors are whispering about having 3 or 4 month's work booked in and suppliers are cautiously boasting of more leads turning into sales, so perhaps the long-awaited thaw has arrived? If it has, you would never guess it from the considerably shrunken Stone Show. It's hard to be certain, but I'd guess the show was half the size of the last such event a couple of years back. I recall thinking at that show, that the place had been 'padded out' with memorial masons and there was a trade that never saw a drop in customers, but even this macabre line of work was largely missing this year. There was some good news. 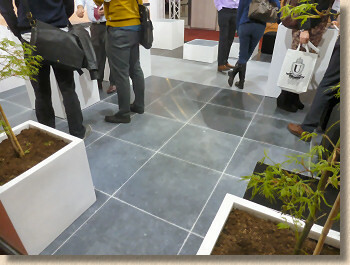 A reasonable presence of British/Irish Stone, and every single one of those valiant exhibitors deserves our congratulations for putting in the effort, but when you consider the scale of the industry in these islands and the sheer number of projects that now use stone as the centrepiece of hard-landscaping schemes, it was only the tip of the iceberg that was on show. No disrespect to those who did show, but it was the names that were absent that raised most eyebrows. There are a significant number of medium-to-large companies that make a very good living from selling stone, and most of them were either completely missing or just skulking around in mufti, seeing what their competitors were up to. 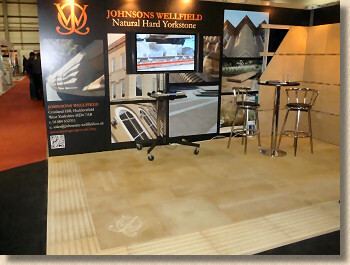 So well done to Johnsons Wellfield for flying the biggest flag (no pun intended) for native stone. A lovely display of the scrumptious Crosland Hill yorkstone, in diamond and shot sawn flavours, with precise tactile units, setts and even some cladding. 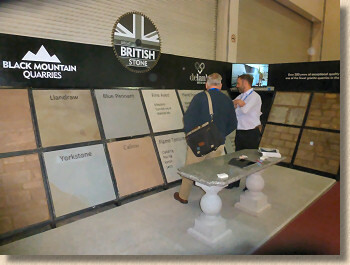 Yorkstone is just about as British as you can get and a stone show without at least one representative would be unthinkable. That there was only one exhibitor doesn't give a true reflection of the importance of this stone to our nation's streetscapes. However, this island is blessed with more than one type of stone, so we also got to see Pennant Stone from the Royal Forest Pennant/Forest of Dean tone firms. Strangely, most of the communications from FoD over recent weeks has been about the publication of a book extolling the company's history and precious little about the wonders of this gorgeous, hard-working stone which graces so many projects in the south and west of the country. Even stranger, when I explained that I was only really interested in paving, and then purely from an academic rather than purchasing angle, a brochure was shoved into my grubby mitts and I was politely but definitely ushered off the stand. I know these company's exist to sell, and I'm painfully aware that I don't buy, but I do like to flatter myself by thinking that I occasionally act as a conduit to those that do buy. I don't like to take up salesbod's valuable time chatting away when there is profitable business to be done, but when there is precious little footfall anyway, to be shut out seems futile. 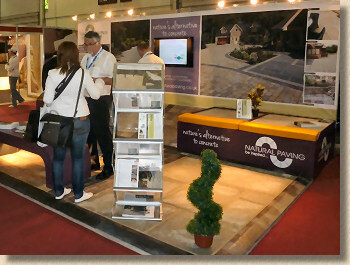 No such problem over at Natural Paving who, once again, produced a truly delightful display in next to no time, and are always eager to have the craic. I might be talking to one particular person, but it's always noted that every other NP person present will make an effort to come and say hello, if only for a few seconds. Now that is how to engender good will! You have to hand it to Natural Paving. They do keep having a go; they keep putting themselves out there, in front of the buyers, and it very deservedly seems to be paying off. The market they serve, which is largely residential and some commercial projects, is fiercely competitive, with more and more suppliers existing only as internet entities, bringing in containers from far flung places and distributing them here, there and everywhere from the comfort of a back bedroom in some instantly forgettable suburb, but NP make the effort to have a recognisable public face, someone to identify, someone to converse with, to answer questions, to provide technical support. And that's a tried-and-tested strategy for success in this market. People buy from people. There will always be those who want to pay the minimum possible and sod the quality, but for the more discerning customer, a personal relationship is that added value for which they gladly pay a premium. Back to the native stone: Welsh Slate were showing, but showing mostly roofing slate. 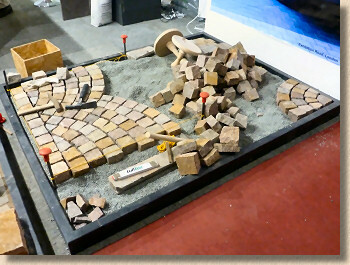 Fair enough, that's what made their name and still earns the biggest wedge of their income, but the unmistakeable indigo and purple stone is widely used for hard-landscaping projects, although you'd hardly tell this from the display at ExCel. Erinstone are the latest to have a go at trying to convince a seemingly reluctant British audience of the merits of Irish blue limestone. Why is this stone so underused on this side of the sea? It's commonplace throughout Ireland but something of a rarity over here, and we're only 60 miles away! It is one of the most versatile of all the stones in these islands. 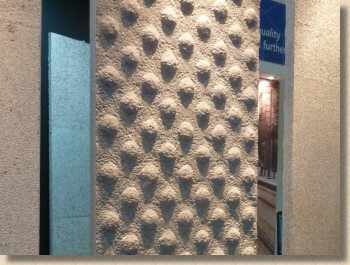 It responds well to so many secondary processes, it's a stone of so many different looks and styles but it's as though landscape architects in Britain, and England in particular, have a blind spot when it comes to stone from the west rather than the east. If we can bring bloody travertine in from the eastern Med, why can't we use supremely cool blue limestone from Kilkenny or Ballinasloe? Admittedly, having a stand that seemed to focus more or less exclusively on floor tiles doesn't really help my case, but take it from me: Irish Blue is a wonderful stone for outdoor use! 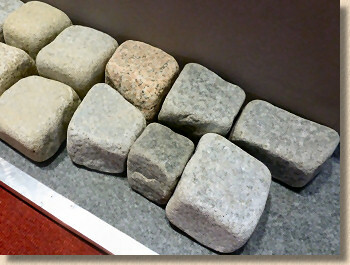 Other native sources include Black Mountain Quarries, with the distinctive De Lank granite, and Stone UK providing some of the better sandstones from northern England. There's a reasonable showing from companies supplying walling or dimensional stone rather than hard-landscaping, although there is, naturally, so crossover between the two traditions. Great Tew Ironstone, Ham Hill Stone, Albion Stone, among others all produce beautiful native stone that is predominantly used for walling. 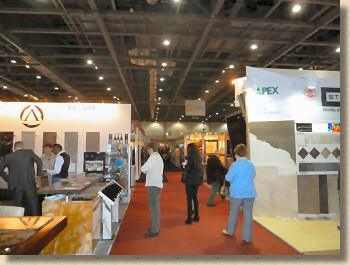 As you'd expect, there was a stronger showing from overseas suppliers, some of whom have British-based distributors, such as Trade Price Stone and their Brazilian Slate, and the inevitable crop of Portuguese granites, Italian porphyry and Mediterranean marbles. Not too much from the Indian quarries, with the notable exception of Malbros, and almost nothing from China, although I did spot an interesting looking indigo slate from Peking Natural Slate that is almost identical to that now being supplied from the English Lake District by Burlington (who didn't exhibit), except it has overly distressed arisses. A number of conversations with both exhibitors and knowledgeable visitors revolved around the plethora of sealants being plugged at the show. I worry about the urban myth that has developed over recent years which seems to suggest that ALL paving MUST be sealed. Why? Look at The Appian Way: only been there a little over 2,000 years and the Romans never bothered with a sealant. There are good reasons to use sealants, impregnators and colour enhancers in certain conditions, but it is totally wrong to suggest that paving always needs sealing. No it doesn't! Very often, it's better off without it! If you are planning to use a sealant ask yourself why: is there a specific reason such as overhanging trees dropping goo, or a damp site that is prone to algae, or is it because the builders' merchant or contractor said that you should? 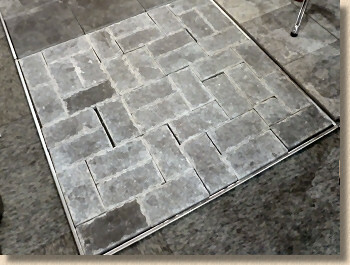 Peking Slate - it's dust, not efflorescence! Anyway, Lithofin, Dry Treat, LTP, Vulcaseal and others all clamoured for our attention, some with sound, honest advice, some with what can only be considered as bovine excrement. It's a tricky subject, and the aforementioned myth is only encouraging ever more dubious suppliers to put their own brand of jollop on the market. Sorting the wheat from the chaff becomes ever harder and, no doubt, the number of reports regarding failed or inappropriate sealants will continue to grow over the coming good weather. Porphyry bogen display What else was worth seeing? The masons' tools from Trow & Holden, a US firm, attracted much attention from the students, but my enquiry about pitching chisels resulted in a totally blank look. Do they have a different term? The Italian Porphyry Company had an intermittent display of sett laying by an obviously knowledgeable and experienced mason with what sounded like a comedy Italian accent straight from the set of 'Allo 'Allo. Fascinating to watch him at work, though. And finally, some lovely, water-worn granite cubes from Portugal's Granites Pardais, which I'd love to see used in a project here in Britain (or Ireland) because I reckon they'd offer a sensuous, reiki-like, barefoot massage in a sun-trap patio area. All in all, I'd seen what was worth seeing (from my point of view) in a couple of hours and so giving up 14 hours, including travel there and back from the big city of Warrington, seems a poor return. It would be unreasonable to expect every major British and Irish stone supplier to be in attendance; even half of them would be wishful thinking, but there should be more than this. As ever, there were grumbles from exhibitors and would-be exhibitors about the costs involved and a lack of support from the organisers. This is never going to rival Venice or Nuremberg but it could be, and should be, a showcase for the industry in Britain and Ireland. This year's exposition felt slightly embarrassing, sort of “Is this all there is?” Is it worth staging such a show if we can't garner active support from some of the bigger names in the trade? Should we leave it to the Europeans and, increasingly, the Chinese and Indians? I'd be loath to see an end to a British-staged stone show, but if it is to survive and thrive, it has to be better than this. Serious blisters on this granite!